STAR TRACE EDDY CURRENT Separators are ready to be installed for separation. 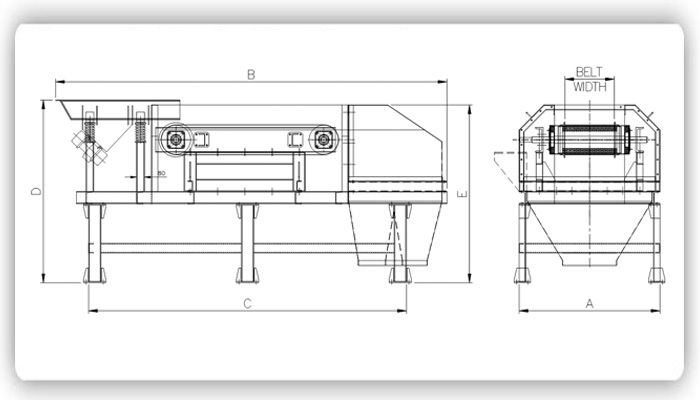 This separator utilizes a powerful Eddy Current Rotor, Conveyor Belt, two variable discharge area and support frame. The optional vibratory feeder provides a consistent flow of material to the Eddy Current Separator. The main principle is that "an electrical charge is induced into a conductor by changes in magnetic flux cutting through it". Moving permanent magnets passing a conductor generates the change in magnetic flux. Eddy current separators are designed according to the principle that conductor can generate induced current in the high-frequency alternating magnetic field. A strong high-frequent magnetic alternating magnetic field generates on the surface of the sorting roller when it works, thus when conductive non-ferrous metals pass through the magnetic field, eddy current will be induced in the body of non-ferrous metals. The eddy current itself will generate the opposite direction magnetic field, non-ferrous metals (such as aluminum, copper, etc.) will leap forward along its transport direction by the performance of magnetic field repulsion so as to separate other non-metallic substances and achieve the purpose of sorting. The main distinguishing criterion is material conductivity and density ratio values; a high percentage of the value of the material is more easily to be separated than the lower material. 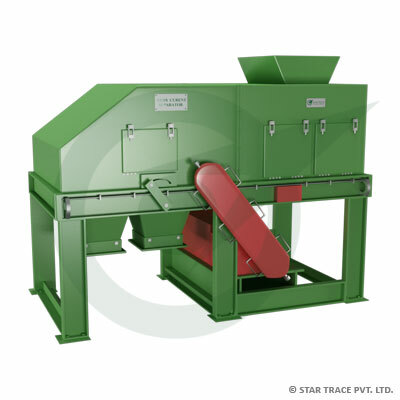 STAR TRACE Eddy Current Separation System encompasses all the equipment above necessary to separate non-ferrous metals and adds ferrous metal separation equipment. It is important to remove ferrous metal prior to exposure to the Eddy Current Separator. Ferrous metal is attracted and held by the strong magnetic force. The ferrous metal will heat up and could burn holes in belt and cause significant damage to the Eddy Current Rotor.